Meizu has launched Meizu 6T Smartphone in China. It has a 5.7-inch HD+ 2.5D curved glass screen with 18:9 aspect ratio powered by a 1.5 GHz Octa-Core 64-bit MediaTek MT6750 processor with 3/4GB of RAM and 32/64GB of internal storage. Dual SIM device runs on Android 7.0 (Nougat) with Flyme OS on top. It has a 13-megapixel rear camera with Sony IMX278 RGBW sensor, LED flash, along with a 2-megapixel secondary rear camera to capture depth information for portrait shots and a 5-megapixel front-facing camera. The Phone has a polycarbonate body and packs a 3200mAh battery. 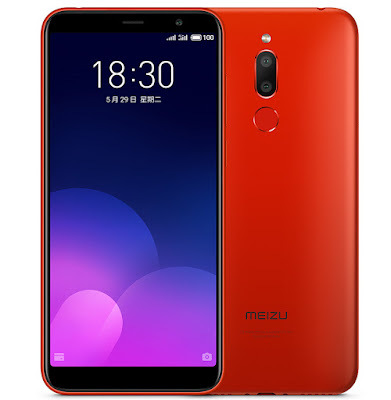 Meizu 6T comes in Black, Gold and Red color priced at 799 yuan for the 3GB RAM with 32GB storage version, 999 yuan for the 4GB RAM with 32GB storage version and 1099 Yuan for 4GB RAM with 64GB storage, goes on sale in China on June 1. MT6750 28 NM JUNK SOC IN 2018, has Meizu actually gone bankrupt.